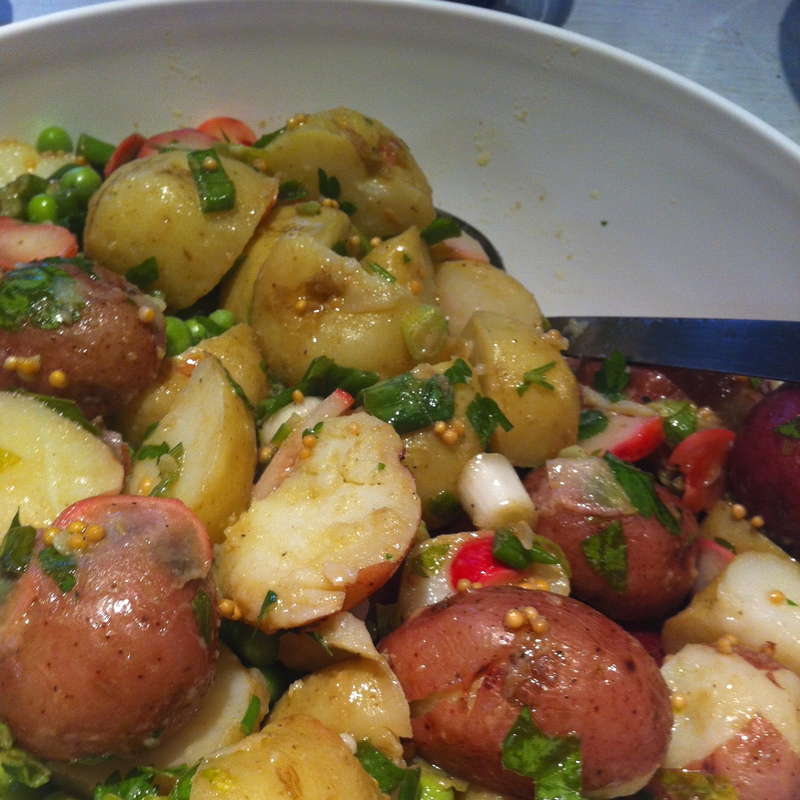 Now there are probably as many variations of potato salad as there are people. I love a simple one of new potatoes, a bit of olive oil, white wine vinegar and fresh dill. I’ve had an unforgettable Hungarian one that was mashed and filled with indescribable secret ingredient deliciousness. The nice thing is, it is hard to go wrong. Heck, you don’t even have to make your own dressing or chop your own vegetables – just toss some boiled potatoes with store bought salad dressing, and precut veggies or greens. Maybe get really fancy and add a hard boiled egg, some barbeque chicken or some garbanzo beans for protein. 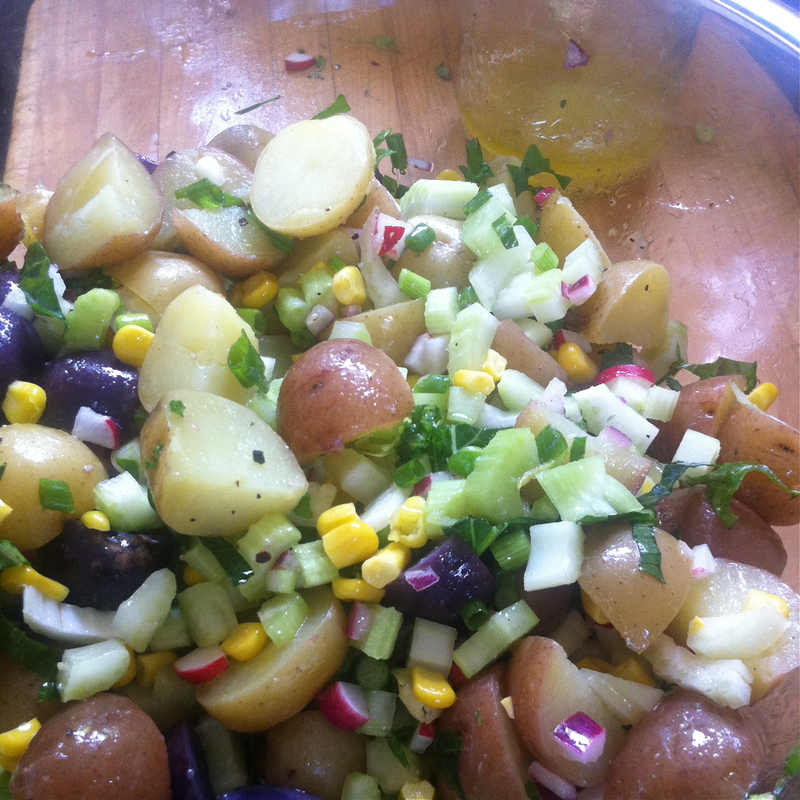 Potato salad truly can be as simple or as gourmet as you want it to be. So with long weekend picnics, potlucks and eating outside in mind here is one variation to get you started. However you prepare it, make it early in the morning or late at night when the kitchen is cooler, toss it in the fridge and then grab it later for a picnic on the beach or for a barbeque with friends. Mixed chopped herbs (thyme, oregano, tarragon) or fresh dill. Boil potatoes. Cook until a fork easily pokes through, but doesn’t break, the potato. 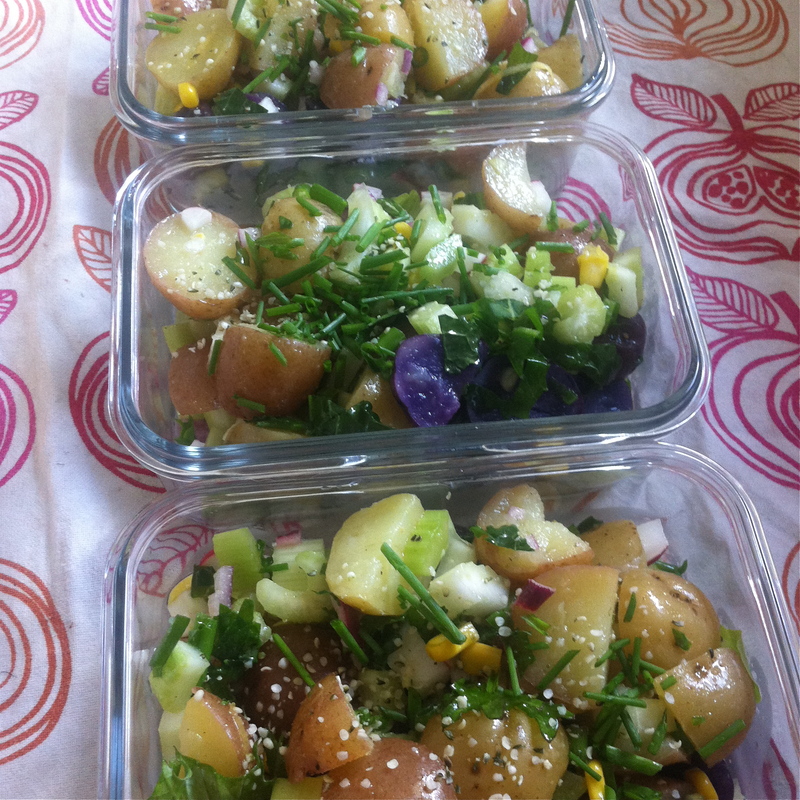 While potatoes are cooking, mix the vinaigrette (just use an empty jar) and chop any vegetables you plan to add. Rinse potatoes in cold water and place in a large bowl. Toss with vinaigrette (you may have some leftover) and vegetables. Eat immediately while the potatoes still have a hint of warmth or let sit, covered in the fridge, ideally for at least an hour, to let the flavours meld. Now pack up that picnic basket and get on outside and enjoy the summer! This entry was posted in Food, Herbs, Holidays, Recipe, Salad, Summer, Uncategorized and tagged garlic, herbs, kale, lemon, olive oil, onion, picnic, potato, pumpkin seeds, salad, sea salt, summer, vinegar by mostlynoodles. Bookmark the permalink.